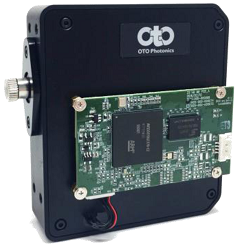 At booth A14 AP Technologies will be showcasing OtO Photonics’ crossed-cavity C-T spectrometer ‘HummingBird’, which offers the performance of the firm’s SmartEngine in a significantly reduced package of just 83 x 75.5 x 26.75mm³. The optical bench provides excellent rigidity, ensuring a platform with high thermal, humidity, shock and vibration stability. HummingBird is currently available with a choice of two 2,048-pixel sensors: a fast-exposure CMOS with dynamic range of 1600:1 and an SNR of 330; or a back-thinned NIR-enhanced CCD with 5000:1 dynamic range and SNR of 500. Further sensors will be added however as the range is expanded. Users are able to specify their preferred configuration, selecting from a range of six slit sizes between 10µm-300µm and twelve gratings, to achieve resolution down to 0.2nm for 100nm bandwidth in the 200-690nm range, or 1.5nm over the full 180-1,100nm range. HummingBird is compatible with OtO’s SpectraSmart spectral measurement software and is supported by Windows and Linux SDKs.